Creativity research has come of age. Today, the nature of the creative process is investigated with every tool of modern cognitive neuroscience: neuroimaging, genetics, computational modeling, among them. Yet the brain mechanisms of creativity remain a mystery and the studies of the brains of “creative” individuals have so far failed to produce conclusive results. But the mystery is gradually yielding ground. As we are reconceptualizing creativity as a complex, and arguably derivative construct consisting of many moving parts, we are beginning to study these moving parts in a systematic way. The old tabloid clichés linking creativity to specific brain structures are no longer tenable, but they do seem to have captured some important aspects of the underlying neurobiological processes. 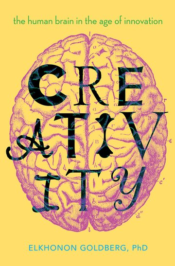 We no longer believe that creativity “resides” in the right hemisphere, but evidence is growing that the right hemisphere is particularly adept at dealing with novelty, an important ingredient of any creative process. In contrast, the left hemisphere appears to be the repository of well-entrenched knowledge and skills, verbal and non-verbal alike, which is an equally important prerequisite of a creative process (remember the giants on whose shoulders we all stand). This is a radical departure from the old notion linking the left hemisphere to language and right hemisphere to non-verbal visuo-spatial processes, and it elucidates the complementary roles of the two cerebral hemispheres in the creative process. Furthermore, the complementary roles of the two hemispheres in supporting novelty vs well-routinized cognitive skills appears to be present across a wide range of species, not just primates, but other mammalians. They are present even in species whose brains are devoid of developed cortex and rely instead on the phylogenetically ancient principle consisting of relatively “modular” nuclei, such as birds (and by extension probably in dinosaurs). Such evolutionary continuities open the door for the studies of the evolutionary precursors for forebears of human creativity. Likewise, it is no longer tenable to view the frontal lobes as the “seat” of creativity, but evidence is growing in linking the frontal lobes to processing cognitive novelty. The frontal lobes, or, more precisely, the prefrontal cortex, is also critical for salience judgment, the ability to decide what is important and what is not. This ability is essential for the creative process, lest the creative mind strays into innovative but inconsequential esoterica. We no longer believe that creativity “resides” in the right hemisphere, but evidence is growing that the right hemisphere is particularly adept at dealing with novelty, an important ingredient of any creative process. But understanding the workings of the mind behind the innovation is only part of the challenge facing creativity research. In a society infused with innovation at an increasingly accelerating rate, understanding its impact on the consumer becomes particularly important. In the not-so-distant past, a human being could acquire a repertoire of knowledge and skills in one’s youth and coast on that knowledge for the rest of one’s life. This was true even for professionals engaged in seemingly daunting intellectual activities. In reality, however, a physician or an engineer could operate throughout much of their professional career on a “mental autopilot,” without much need to update their professional knowledge or skills. This was even more the case for a person’s ability to navigate daily life. But today new technologies and knowledge saturate society at such a rate, that even the laziest and least intellectually inclined among us are forced to absorb innovation all the time, whether we like it or not, both in our professional activities and in everyday life. The ever-accelerating rate of innovation places unprecedented demands on its consumer and makes the consumer a real partner in the process to a degree unprecedented in the history of our species. When you see an octogenarian using an iPhone or an iPad, you can safely assume that she did not grow up with either of these hi-tech devices, that nothing in her early background prepared her for the flood of new electronic technologies, yet here she is, operating them confidently and competently. How does the human brain function in this new environment? How does it develop and how does it age? How do these radical changes in the degree of novelty exposure change the nature of psychiatric and neurological disorders, such as dementia? Finally, in our increasingly technological world, the question of Artificially Intelligent (AI) creativity inevitably arises. Offensive as this may sound to the more exceptionalism-mined members of our own species, if creativity is defined as a conjunction of novelty and societal relevance, then the authorship of the creative process should not be part of its definition. Until now, AI has focused on the design of dedicated devices each adept at performing a pre-specified, relatively narrow class of task. But more recently the Artificial General Intelligence (AGI) movement is gathering speed with an audacious goal of designing artificial devices capable of open-ended learning and yes, creative processes. Today, AI-generated art, both paintings and music, has been judged by human connoisseurs as “creative.” How we, the biological humans, will fit into this brave new world and how we’ll be changed by it, is yet another question for future creativity research. Featured image credit: Child painting by EvgeniT. CC0 via Pixabay. Elkhonon Goldberg, PhD, ABPP, is a scientist, clinician, and educator. He is Director of Luria Neuroscience Institute and Clinical Professor in the Department of Neurology, NYU School of Medicine. Goldberg is internationally renowned for his research in cognitive neuroscience and clinical neuropsychology. He has authored several widely acclaimed books which have been translated into many languages. He lectures worldwide. Goldberg is also a clinician with an active practice in neuropsychology. He is the author of Creativity: The Human Brain in the Age of Innovation, recently published by Oxford University Press.